Our application is supported by computers, laptops, tablets and smartphones! It works on different devices, systems and web browsers. Adjusts to every device. Working on the calendar with the use of a small tablet or smartphone is not a problem. The application saves time previously spent on manual creation of reservation calendars. 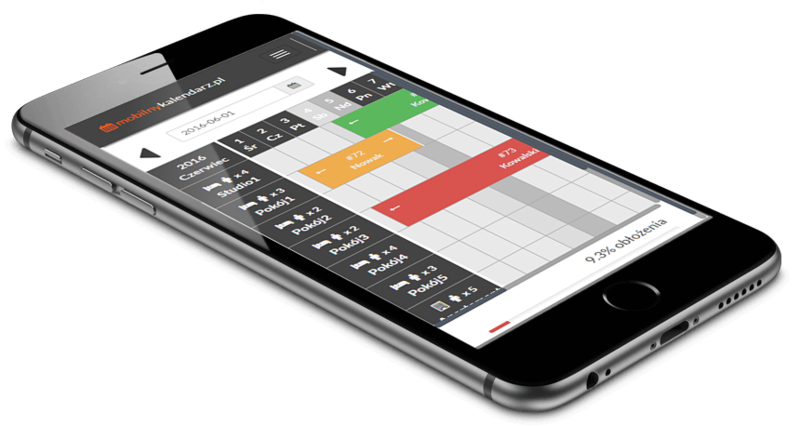 Taking bookings on the phone gives great comfort, saves time and gives full control over the management of the resort. How many rooms can I add to the mobile-calendar? - Each user can add any number of rooms. Do I have to subscribe to fully use the functionality of the calendar? - To use the application, you simply register. The trial period of 30 days is free of charge. Who is the Application designer for? - The application is designed for people who run tourist facilities or other services. Is mobile-calendar adapted to mobile devices (tablets, smartphones)? - The application is fully responsive, automatically adjusts the screen on which it is displayed. Does anyone besides me see information about my reservations? - Noone except the account holder sees information related to its reservations. When adding new bookings, it automatically creates a customer’s base. Enter the search terms and the app will show you a free room. Generate reports of the arrivals and departures of the day. The application contains an invoicing module for the clients. Checking free terms on your website by customers. Based on the book added to generate statistical reports and cash. At any time you can export the reservations to a file and have them on your hard drive. The application remembers your term deposit payment for the booking. Ability to configure individual pricing for the building and rooms. Quick copy reservation for group arrivals. The distinction between types of beds in various types in the room. The application is equipped with a dynamic reservation search engine. Order confirmations via e-mail to the customer. Automatic conversion of debts to pay. Possibility to transfer the booking to another room. Filtration of rooms by type and number of people.